After Saturday’s draw at Gainsborough Trinity it occurred to me that on the last three occasions that Chester have drawn an away FA Cup game they have then proceeded to lose the home replay. Here’s hoping for a change in fortune on Wednesday. In 2006 Chester did go through to the next round after Bury were thrown out of the cup for playing an ineligible player. The last time Chester won a home FA Cup replay was in 1999/2000 when they beat Whyteleafe 3-1 after one of their worst ever cup performances down in Surrey when they drew 0-0. The recent articles on league records seems to have attracted a lot of attention so I’ve put together some basic FA Cup statistics which I may develop depending on progress in the competition. Saturday’s game at Gainsborough Trinity will be the first time that Chester have appeared in the Second Qualifying Round of the competition since they were beaten by Bangor City in 1927. The last time they won at this stage was 1925 when Witton Albion were beaten 4-2 after a replay. I’ve put together a table showing the rounds that Chester have reached since they first entered the competition in 1886. It doesn’t completely reflect the progress that has been made as the round numbering has changed over the years. For instance Chester has reached the last 16 on three occasions. In 1890/91 this meant an exit in the Second Round but in 1976/77 and 1979/80 this meant elimination at the Fifth Round stage. The most rounds the club has played in a season is six in both 1890/91 and 1921/22 although they received a bye in the Fourth Qualifying Round in 1890 when Irish side Cliftonville scratched from the competition. In 1921 they played in eight games which is the highest number of games in a season. The biggest victory came in 1892 when Liverpool side Stanley were beaten 11-0. Chester also hit double figures in 1927 when Lostock Gralam were hammered 10-1. The worst defeat came in 1890/91 when eventual cup winners Blackburn Rovers won 7-0. Chester’s FA Cup record is not as impressive as the League Cup. They have never beaten a team from the top tier in the FA Cup and there have been only three occasions when they have beaten a team playing at least two divisions above them. 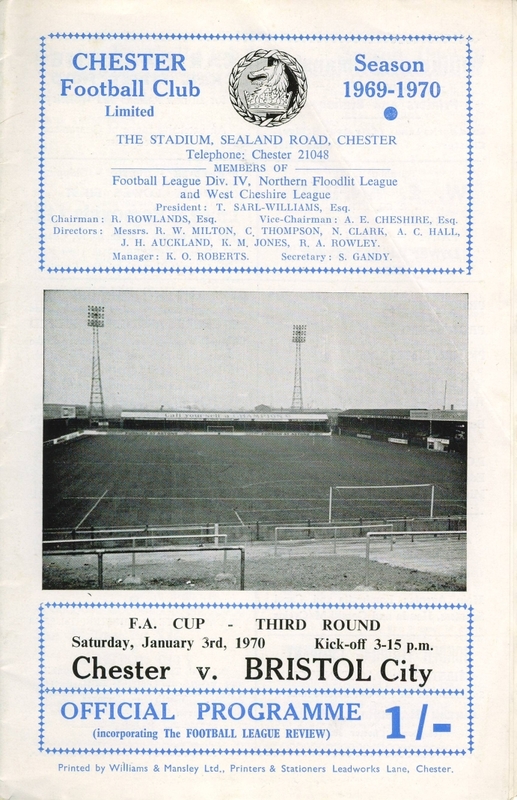 While playing in the Fourth Division, in 1969/70, Chester beat Second Division Bristol City 2-1 with goals from Keith Webber and Billy Dearden. More recently, in 2000, Graham Barrow’s Blues came from 2-0 down to beat Oxford United 3-2 in one of the most exciting games seen at the Deva Stadium. At the time Chester were in the Conference while Oxford were struggling at the bottom of the third tier of league football. Two years later the Blues were still in the Conference when they won by a single Chris Tate goal at Colchester United. On this basis I would put forward the Bristol City game as, at least statistically, Chester’s finest ever FA Cup victory. It is a game that is rarely mentioned and perhaps should be elevated above the 5-0 win against Fulham in 1932/33 and the 2-0 Third Round win at Newcastle in 1979/80 when the opponents were only one division higher. Best ever FA Cup victory? After three more victories, against Altrincham, Solihull Moors and FC Halifax Town, here is an update on the current records. I’ve also added a couple of additional statistics to accompany them. After six wins the club record of seven consecutive victories from the start of a season will be equalled if Chester can beat Guiseley on Saturday. On reflection I think it is valid to include the 1914/15 season so it is currently a 98 year old record that is up for grabs. We have now reached 22 games unbeaten but there is still a long way to go to reach the 31 games in the Combination between January 1908 and March 1909. 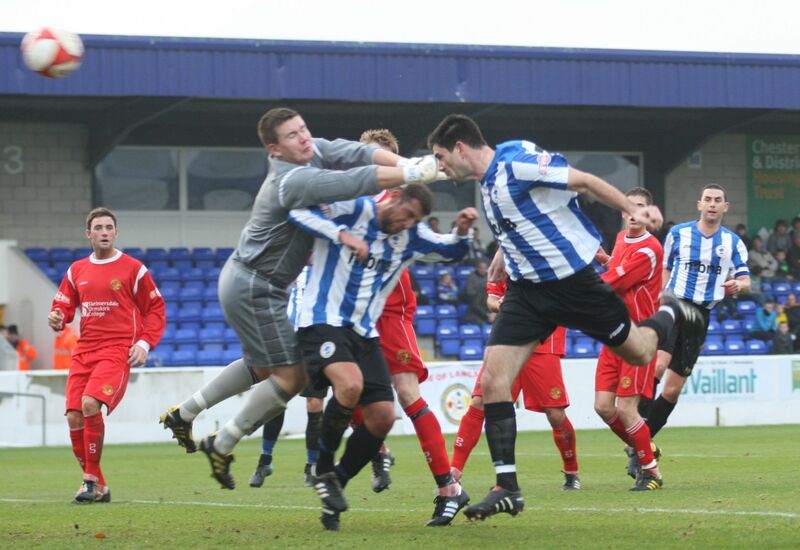 Victories at Altrincham and Solihull have equalled the Chester FC record of 15 unbeaten away games. If defeat is avoided at Boston United and Stalybridge Celtic the club record of 17, set in 1930/31, will be equalled. 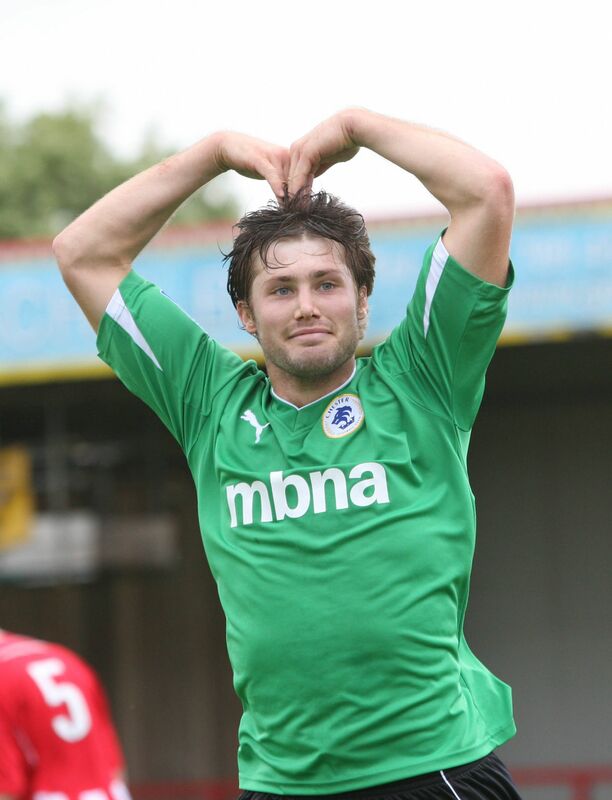 Chester have won the last 10 away games which beats the 9 away victories in 2010/11. The overall club record of successive away league victories is 13 in 1930/31. Chester have now scored in 45 consecutive league games which is comfortably a record. The last time that Chester dropped a point was in the 1-1 draw with Northwich Victoria that clinched promotion in April. Neil Young’s side have now won the last nine games which equals the reformed club’s record set in the nine matches immediately prior to the Northwich fixture. This also means that Chester have won 18 of the last 19 games. The club record was set between November 1925 and February 1926 when 13 victories were recorded in the Cheshire County League. Ben Mills has scored in five consecutive league games which equals the Chester FC record set by Michael Wilde when he scored against Cammell Laird, Mossley, Ossett Albion, Skelmersdale United and Radcliffe Borough in the first season. It’s also worth mentioning Matt McGinn, who scored in four games in September last year, while Michael Powell also banged in four in the last four games of 2010/11. The club record was set by Bill Pendergast in the 1938/39 season when he scored in 12 consecutive Division Three North games. He also netted against Bradford City in the FA Cup in the middle of this sequence. Prior to that Arthur Gale scored in nine consecutive games during 1930/31 when most goalscoring records were set. As you can imagine some of these figures are tricky to check so I hope my adding up is correct. If you think there are any errors please get in touch.